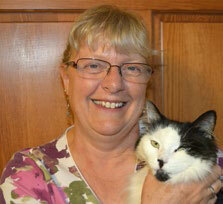 Dr. Cathy Eppinger has been a practicing small animal veterinarian for 32 years. She did acupuncture training in 1998-99 at CSU after her Doberman Pinscher, Puccini (aka Pooch), responded to acupuncture treatment for her spinal arthritis after all the medications available at the time were not effective or had unacceptable side effects. Since then, she has been a DOC numerous times. She is now doing relief work in Boulder County and providing acupuncture, manual therapy, and massage on a house call basis through her business, Paws on Wheels, LLC. Her son and daughter have flown the coop and her husband has retired, so she is spending more time with her two dogs and three cats – the current color scheme being black and white. She is also a certified yoga instructor.